Eliminate the health IT usage metrics in MIPS since it already measures the end results of quality, cost, and practice improvement. Eliminate the use of visit documentation E/M codes along with the box-checking tasks that are required for payment. Focus on how and when data is exchanged rather than focusing on the individual data elements, with the goal being to reduce the irrelevant information that is automatically generated in exchanging CCDAs. Fund the creation of consistent data models in a physician-led process. Reduce the number of products and services that require prior authorization; develop a standard form that all payers use; require payers and PBMs that create a PA specifically to save themselves money to pay physicians for the time required to complete those forms; and eliminate PAs for durable medical equipment, imaging, supplies, and generic drugs. Adopt a single set of quality measures that span all public and private payers. Develop a single, EHR-populated form for justifying orders for medical supplies and services. 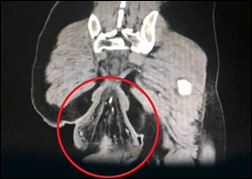 From Constantine: “Re: a radiology question for your readers. Are any healthcare organizations sending preliminary results from a radiology AI application to the EHR prior to radiologist review?” It will be interesting to see if radiology departments trust AI analysis enough to post the preliminary interpretation in the EHR. My guess is no, but we will see. From Aleutian: “Re: Stanford cancer vaccine announcement. Sounds promising. 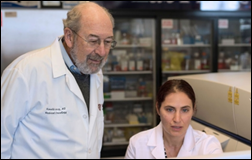 What do you think will happen?” Oncologist Ronald Levy, MD and postdoctoral fellow Idit Sagiv Barfi, PhD (above) find that directly injecting a combination of immune-stimulating agents into mice tumors (breast, colon, and melanoma) kills both the tumor and any metastases, in essence curing cancer in 87 of 90 mice. If it works in humans – and that’s a big if – the treatment would offer a fast, cheap way to stop cancer in is tracks without the side effects inherent with tweaking the patient’s entire immune system. Stanford is starting clinical trials in lymphoma patients, for which we should all keep our fingers crossed. It sounds like they will find out quickly if it works since the effect is nearly immediate. From Privacy Guy: “Re: DuckDuckGo’s privacy browser add-in. It doesn’t grade the HIStalk site well and they’re apparently anti-Google and Facebook.” The HIStalk low grade is because the site (a) doesn’t use encrypted sessions, and (b) articles sometimes link to rather innocent third-party systems such as Twitter and YouTube that can track user behavior. I’m considering implementing SSL security just because Google downgrades search results for unencrypted sites, but there’s little benefit otherwise – the only information you can enter here that could be intercepted would be an article comment. Most poll respondents attend the HIMSS conference either because their job requires it or because they like socializing and visiting the exhibit hall. I can’t say I’m shocked. New poll to your right or here: Would you be satisfied if your doctor prescribed a digital health app rather than a medication? Thanks for the great responses to “What I Wish I’d Known Before … Taking a Job Selling Software to Hospitals or Practices,” which contains useful insight whether you’re a seller or a buyer. This week’s question is timely – if you’ve attended the HIMSS conference as an exhibitor, take a minute to share your thoughts about what you wished you had known beforehand. Welcome to new HIStalk Platinum Sponsor Mobile Heartbeat. The Waltham, MA company is a leading provider of enterprise mobility clinical communications and collaboration solutions. Its Clinical Unified Results Enterprise (CURE) technology powers MH-CURE, which improves clinical workflow by giving clinicians what they want and need, no matter where they are. MH-CURE consolidates alarms, notifications, patient information, lab data, texting, voice, and photography. Some of the country’s largest health systems have reported results that include 31 percent faster clinician response time, 50 percent improvement in HCAHPS scores, and 50 percent reduction in noise. Its patient-centric Dynamic Care Team director connects team members – inside and outside the hospital – to the patients they are caring for, ensuring that patient alerts and notifications are sent to the right person, who can then quickly engage other team members. Thanks to Mobile Heartbeat for supporting HIStalk. CEO Brent Lang says several customers have purchased the rules-driven Engage care team communication platform. Q4 sales include $2.8 million deals with the DoD and Sutter Health as well as a system-wide implementation at BayCare (FL). Lang says the company expects overall hospital IT spending to increase 5-7 percent in 2018, mostly for back-to-basics solutions that reduce cost or increase efficiency. He says the BYOD movement is limited for hospital clinical workers and more health systems are instead providing company-owned devices for better security. Widespread consumer acceptance of a voice user interface will open up possibilities and the company is investing in speech recognition technology. The company is working with Caravan Health to create the CPSI Rural ACO Program to help rural providers transition to value-based care. The $28 million impairment charge is because of poor revenue and high development costs of the American HealthTech post-acute care product, which contributes 8.7 percent of CPSI’s revenue. (Healthland acquired American HealthTech in 2013 for an undisclosed price, then CPSI acquired Healthland for $250 million in late 2015). 15 percent of Evident clients are live on CommonWell. The company hasn’t seen any impact from the Allscripts ownership of the former McKesson Paragon, which it says doesn’t really play strongly in CPSI’s target market of hospitals under 100 beds. The company’s strongest competition has shifted to Cerner, Epic Community Connect, Athenahealth, and Meditech. An analyst asked why hospitals running older systems would replace them without government incentives, with the company answering that the driver is doctors who are unhappy with usability and software completeness, especially with those systems that were bought quickly to earn Meaningful Use money. I missed this earlier: Quality System (NextGen) posts Q3 results: revenue up 3 percent, adjusted EPS $0.15 vs. $0.23, beating revenue expectations slightly and meeting on earnings. QSII shares have dropped 20 percent in the past year and are trading at their 52-week low, valuing the company at $800 million. A review of the New York healthcare startup landscape predicts that health IT investment will decrease in an overheated market, with the hope that someone will buy digital health companies that are losing too much money to run an IPO. Most of the M&A involved big companies buying point solutions vendors for under $100 million. A growth equity executive says hospitals are busy running expensive EHR implementations and insurer consolidation has left fewer customers in that sector, so pharma is the best bet. Community Hospital Corporation (TX) chooses Parallon Technology Solutions to provide 24/7, US-based help desk services. The state of Queensland, Australia selects Sunquest for a 10-year, $54 million laboratory software and services contract. Lake Area Medical Center (LA) will switch from Medhost to Meditech in 2018. Gulf Breeze Hospital (FL) went live with Allscripts in December 2017. Paoli Hospital (PA) will go live on Epic on March 3, 2018. DocuTAP hires Rob Rueckl (Edmentum) as CFO and Jared Lisenby (PointClear Solutions) as SVP of sales. Logicworks launches Pulse, a cloud monitoring solution that integrates with AWS and Azure to look for security gaps, architectural red flags, and unusual traffic patterns. 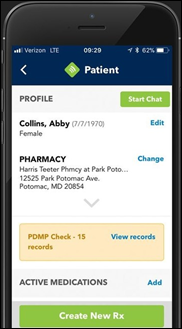 DrFirst announces a mobile e-prescribing app intended to improve opioid prescribing by integrating with state PDMP databases, providing medication history and medication adherence information, and making it easier to prescribe shorter-term therapy that can be easily extended if needed. Healthcare spending jumped 15 percent from 2012 to 2016, not because patients consumed more services, but because providers keep raising their prices unsustainably even as usage declines. Surgical admissions declined 16 percent, but the average price increased $10,000 to $42,000. In China, a man playing games on his phone while sitting on the toilet for 30 minutes has a rectal prolapse and requires emergency treatment. You publish-or-perish academics might want to create an observational study to determine how many people (with a male vs. female comparison) whip out their phones during stall visits of greater than two minutes. Liaison Technologies breaks company revenue records in 2017 thanks to Alloy Platform’s marketplace momentum. A NEA survey pinpoints the top 10 dental practice pain points. Sunquest Information Systems will exhibit at Molecular Med Tri-Con February 11-16 in San Francisco. TriNetX will exhibit at the Scope Summit February 12-15 in Orlando. Jay Silverstein (Picwell) joins ZappRx’s Board of Directors. That might not be as innocent sounding when you consider the users posting comments that might anger their employer if they do so on company networks and they happen to be peeking. The good news is that after I wrote that, I went ahead and set up SSL encryption on the site. The browser bar now shows the “locked” indicator and Chrome shows a green “secure” as all pages redirect to https. ??? 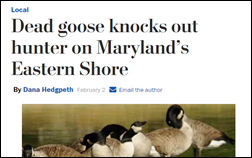 It isn’t even ambiguous – the ICD-10 code is W61.52XA, “Struck by goose, initial encounter”. (There’s also a “struck by duck,” my go-to example for training. This allows interpretation of the “crushing” to be of the ego, pride, or dignity of the hunter. Or would that require a DSM-V code?